Last night, I was able to be part of baseball history (Wait readers, don't go!). I was able to see a No No (no hitter) pitched by Jon Lester. For non-baseball fans, that means that the other team never got on base because of a hit. It's a rare thing to accomplish and rare to get to be there to see, scream at and jump up and down for. 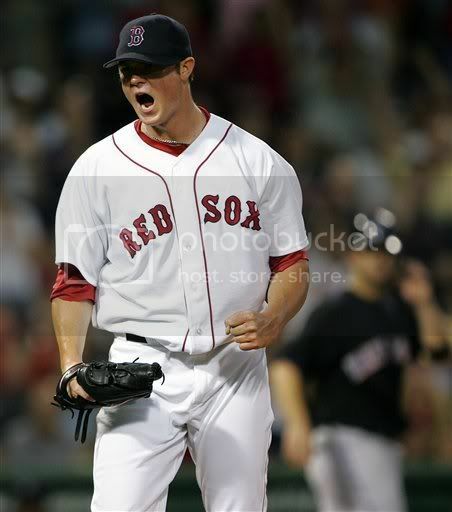 I was thinking about the pitcher, Jon Lester, who battled cancer a little while ago. Every time Jon Lester is mentioned, his battle with cancer is always mentioned. It's like when someone wins an Oscar and forever their name is changed to "Academy Award winner (fill in the blank)." Lester's new name is "Cancer survivor Jon Lester." Never having been through an illness or traumatic experience (thankfully) such as that, I have been asking myself how I would react to that personally. Does he ever wish he could escape the cancer prefix, or does he himself always want to remember what he overcame? I think I would want to escape it. If I had overcome cancer, I'd want people to forget and treat me normally again, without the constant reminder. I guess because of that, I try to treat people who have been through something traumatic normally. It's not like I never bring it up, but I only bring it up if it is relevant to the conversation or situation. It's a tricky balance. Then I began to think of Abram and Sarai and Jacob who all underwent name changes. In today's media it might be "Father of many nations Abram" or "Struggled with God Jacob" or "Finally havin' a baby Sarai." God specifically changed their names to make note and remind them of a specific event or promise. Of course, in these situations, the changes were positive. Does one event/illness/situation define you forever? Should it? Would you want it to? Sticky things to think about! P.S. When I went searching for a picture to add, the first thing I clicked said, "Cancer Survivor Jon Lester Throws a No-Hitter" !! Coming up next.... switching gears to more sewing projects! An event or illness of this magnitude changes who you are. Even if you can live it down publicly, it will always be with you inwardly, and it will always be one of the defining parts of who you are. Most of us would rather run from this, I know I would, but you can never escape. The key is to allow the Lord to use who you've become through this event to touch the lives of others and to make you strong in Him. There's an old say that goes, "It can make you bitter, or it can make you better." We take our pick.